Landscape: Two lush, volcanic islands inside a single lagoon. History: Raiatea was originally called Havai'i, and legend has it that Queen Rainuiatea renamed the island after her parents - Rai and Atea. It was traditionally the center of political, religious, and cultural holding of Tahiti-Polynesia - at least until the Europeans came. Captain Cook visited Raiatea three times - it is said that it was his favorite island. In his three visits, ranging between 1769 and 1777, Cook spent a total of about two months anchored in the Raiatea lagoon. The people of Raiatea accepted Christianity after the Tahitians did. Their conversion was probably quickened by the arrival of the noted Protestant missionary John Williams. He departed from there to Rarotonga in the Cook Islands in 1823. When France annexed the Leeward Islands in 1887, they were met by a ten-year resistance from Raiatea. Chief Teraupoo, the leader of the campaign, was eventually captured as French troops swarmed the island and warships filled the lagoon. He was deported to New Caledonia, and the Queen of Raiatea was exiled to the remote island of Eiao with 136 of her followers. (Sue) On our first visit to Raiatea I was struck by the lack of sandy, reef-side anchorages which we had always sought out in the other Society Islands. Instead, we found ourselves nosing into deeply cut bays with water depths of over 80 feet. On our return at the end of March, we had more time to explore and found some lovely spots in 8 feet of water over white sand. 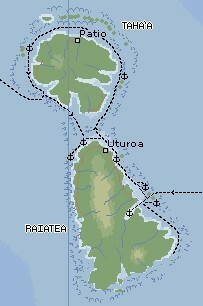 Raiatea has the second largest population after Tahiti, but its small town of Uturoa is a lovely place with a city dock (harboring the ferries to Tahaa), a few banks, general goods stores, three grocery stores (none very big), and some tourist shops for those arriving by cruise ship. There are no public buses, so hitching is the norm for visiting yachties as we made our way the 6 miles (10 km) from the anchorage off a boat yard (where we found all the other cruisers) to the town of Uturoa. The highlight of the Raiatea visit was the dinghy trip up the river at the head of Faaroa Bay. We reveled in the fresh water scent, the overhanging branches of giant hibiscus, and the floral displays along the banks. We went up twice, once with our visitors Bill and Mary and their kids, and again with cruising friends on Cookie Cutter. On the second trip we tied the dinghy to a dock and walked ashore through the botanical garden. Many photos we took are on the French Polynesia Flora page. (Amanda) It's rather a shame that we spent so much time in Raiatea when there were much more beautiful, remote anchorages that we could have gone to (including in Bora Bora) but I guess the cruising inertia just sort of kept us in one place. For there we found the largest cruising community since Tahiti - and lots of the boats in Tahiti had been French. But the sad bit was that most of the boats we wanted to hang out with in Raiatea were up on the hard for the cyclone season, or just barely coming off - which meant they were spending the next few weeks at the dock. But that didn't stop us from finding any little anchorage we could and milking it for all it was worth - my sadness is that we didn't ever get back up to Tahaa after circling around it so briefly before toodling off to Bora Bora. The anchorages were shallower, the sand sandier, the sun brighter... okay maybe that's going a bit far. Maybe it's just human nature to want what you didn't have. If we had spent all that time in Tahaa instead, I would be griping that we never got to the town, and there was no one around, etc. etc. You all probably know how it goes. (Jon) We had a glorious spinnaker run from Huahine to Raiatea with Bill & Mary. Once there, we took the dinghy exploring up a fresh-water stream, a fun activity as the scenery is very different, we can explore with minimal exertion, and even take a fresh-water swim if we want. Then we proceeded to explore some of the motus on the outer reef that surrounds both Raiatea and Tahaa, looking for the beautiful sandy banks and snorkeling grounds we'd found on Huahine. We spent several days circumnavigating Tahaa (without actually going ashore at the main island), anchoring at some of the outer motus. When we returned from Bora-Bora, we anchored near the NW corner of Raiatea where the other cruisers were (Cookie Cutter, Amadon Light, Hawaiian Song, Mintaka, Heidi, Prism, Captain's Fansea, Embla, Music, Dazzler, etc.). Most had put their boats on the hard for cyclone season and were just returning and getting their boats back into sailing trim. We were more interested in playing as we were already mostly in cruising trim except for having to wait for watermaker parts (a small ring had broken inside our watermaker - Spectra sent us 4 replacement rings, 2 ring removal tools, and 2 new pump heads, all for free, allowing us to bring our watermaker back to like-new condition). 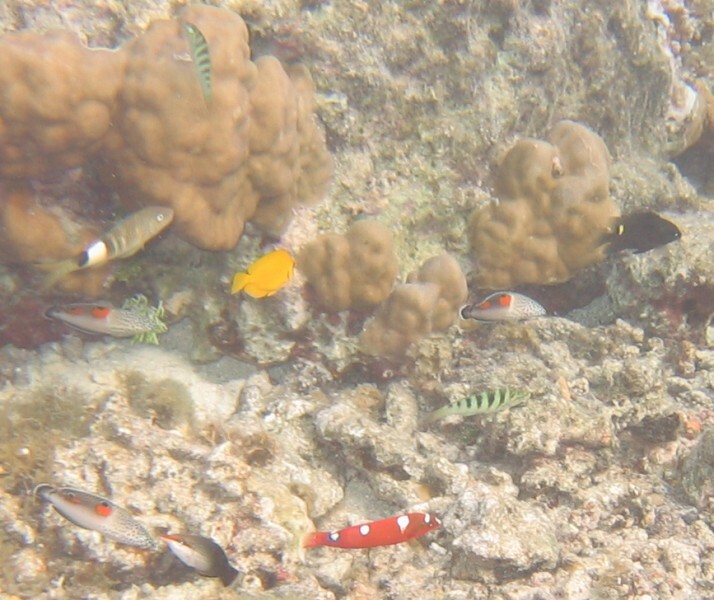 So we anchored out about 1/2 a mile (1 km), on the edge of the sand-bank but over a 50' coral wall. While the weather was calm, it made for nice snorkeling. 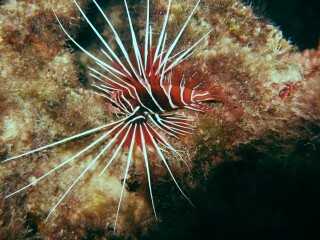 We even did a night snorkel, and Chris got some nice pictures of a clearfin lionfish, with its long, poisonous spines. The town of Uturoa was quaint. Without public transit, we had to hitchhike each way. It felt strange teaching my teenage kids how to hitchhike, but it's probably safer here than most places. Throughout French Polynesia, I was repeatedly picked up by women driving alone - life here seems delightfully safe that way. Since our next stop, Tonga, had little to buy besides fresh fruit and vegetables, we stocked up on some canned and frozen items, but there wasn't much available. We also stocked up on fuel, which was a bit of a mistake as gasoline was much cheaper in Tonga (but the diesel proved useful on the passage). (Chris) While we certainly spent a long time in Raiatea, my best memories are not of the island itself or its little town, but the snorkeling (I wanted to dive, but we never did) inside the island's barrier reef. I got lots of practice with the underwater digital camera, trying to get the best shots of fish, corals, eels, shells, and so forth. The most exciting snorkeling trip was at night during the full moon. Urbanites might not believe me (I'm not sure I would have), but down here it is possible to read a novel by the light of the full moon. We were anchored out on sand flats that stretch out to the barrier reef, but there were several coral heads nearby. Of course, the water dims the moonlight so much that we had to take lights with us (in plastic bags, since we don't actually have any underwater lights) but I had a lot of fun. Unfortunately, we didn't really see the coral polyps we had hoped would be out (the full moon may have actually been too bright for them.) 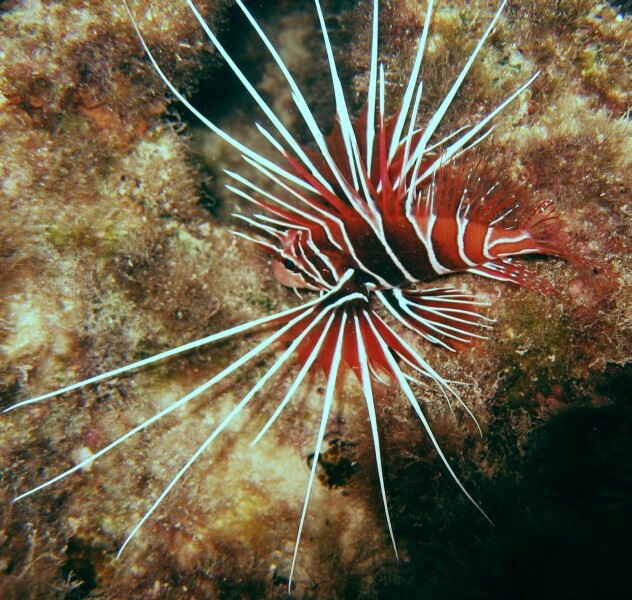 However, I did get some great pictures of a lionfish. Imagine free-diving diving 20 feet (6 meters) holding a light in a bag in one hand, a camera in the other, to photograph a lionfish at night! Very exhilarating, but I think we need some better lights. I would love to go for a night dive sometime. 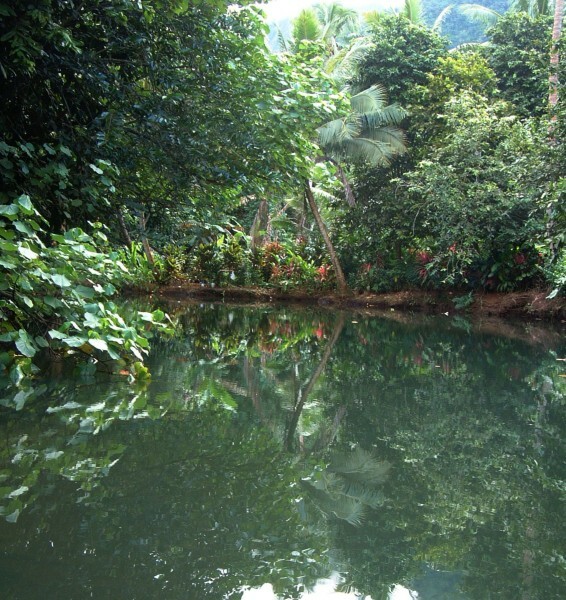 The other exciting part of Raiatea itself was the Apoomau river, the only navigable river in French Polynesia. Large, slow-moving, and beautiful, the river was decorated with a scattering of glorious blossoms in colors ranging from purple-red to dark yellow. The banks were lushly vegetated and the water was calm enough to reflect the surrounding scenery. Raiatea was also memorable for all the friends there, both coming down from the US (Bill, Mary, Meredith, Brendan, and Pam and Kathy) and those newly met, cruisers such as Peter and Connie on Cookie Cutter. There is a large haul-out and storage area on Raiatea, and many cruisers were coming off the hard as we arrived. Tahaa was, for me, an area to explore underwater. 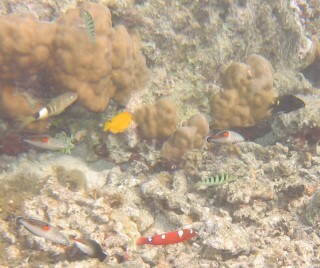 I don't think I even touched the island, but I enjoyed snorkeling its nearby reefs. I keep asking to dive more, but no such luck. Of course, we did have non-diving friends on board.